Freddie Mercury was the leased vocalist, co-songwriter and record producer, of the rock band Queen. He also became known for his flamboyant stage persona and four-octave vocal range. 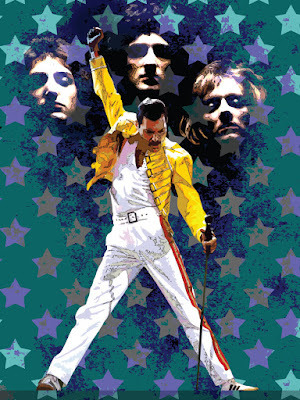 Mercury wrote and composed numerous hits for Queen including "Bohemian Rhapsody," "Killer Queen, Somebody to Love, Don't Stop Me Now, and Crazy Little Thing Called Love. He occasionally served as a producer and guest musician for other artists; and concurrently led a solo career while performing with Queen. Mercury was originally named Farrokh Bulsara and was born of Parsi descent in the Sultanate of Zanzibar where he grew into his mid-teens before moving with his family to Middlesex, England. He ultimately formed the band Queen in 1970 with Brian May and Roger Taylor. Mercury died in 1991 at age 45 due to complications from AIDS.